The first image of the sun captured by NASA's Nuclear Spectroscopic Telescope Array (NuSTAR), which is sensitive to high-energy X-ray light. X-rays seen by NuSTAR show up as green and blue in the photo, which is overlaid on an image taken by NASA's Solar Dynamics Observatory. A NASA space telescope designed to peer at faraway black holes has snapped a stunning image of the sun, showing that its sensitive X-ray eyes can investigate mysteries in Earth's own neighborhood. 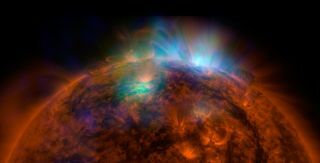 The new image, which was taken by NASA's NuSTAR spacecraft (short for Nuclear Spectroscopic Telescope Array), is the best-ever view of the sun in high-energy X-ray light, space agency officials said. The photo, and others taken by NuSTAR in the future, should help researchers learn more about our star, they added. The new image, which was released Monday (Dec. 22), overlays NuSTAR observations (seen in blue and green) onto an image of the sun captured by NASA's Solar Dynamics Observatory spacecraft. "At first, I thought the whole idea was crazy," NuSTAR principal investigator Fiona Harrison, of the California Institute of Technology in Pasadena, said in the same statement.. "Why would we have the most sensitive high-energy X-ray telescope ever built, designed to peer deep into the universe, look at something in our own backyard?" Harrison eventually warmed to the idea, NASA officials said, after realizing that NuSTAR might help solve some long-standing solar mysteries, such as the "coronal heating problem." One possible explanation is that "nanoflares" are helping to drive up coronal temperatures (along with the much larger, and easily observed, standard flares). NuSTAR may be the only instrument capable of detecting these hypothesized faint phenomena, NASA officials said. Dark matter apparently does not emit or absorb light — hence its name — and nobody knows for sure what it's made of. A number of exotic particles have been proposed as dark matter constituents, including weakly interacting massive particles, sterile neutrinos and axions.